Purpose – The purpose of this paper is to present the results of a qualitative study of software engineers' playful behaviors at work. Design/methodology/approach – The interviewed software engineers come from two European and three American companies. The research is based on ethnographical data, gathered in two longitudinal studies2005-2008 . The methods used in the study include open-ended unstructured interviews, participant observations, stories collection, and shadowings. 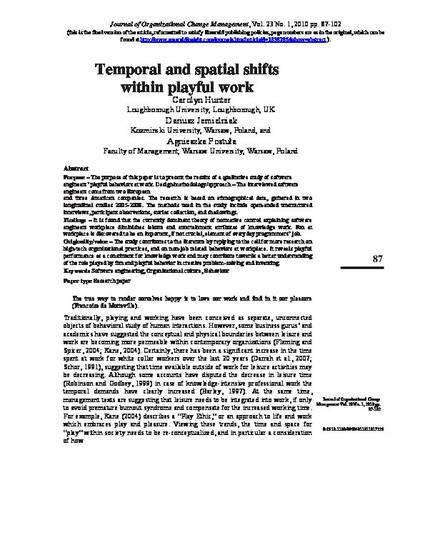 Findings – It is found that the currently dominant theory of normative control explaining software engineers workplace diminishes leisure and entertainment attributes of knowledge work. Fun at workplace is discovered to be an important, if not crucial, element of everyday programmers' job. Originality/value – The study contributes to the literature by replying to the call for more research on high-tech organizational practices, and on non-job related behaviors at workplace. It reveals playful performance as a constituent for knowledge work and may contribute towards a better understanding of the role played by fun and playful behavior in creative problem-solving and inventing.